It’s A Blue Moon New Year’s Eve Party! 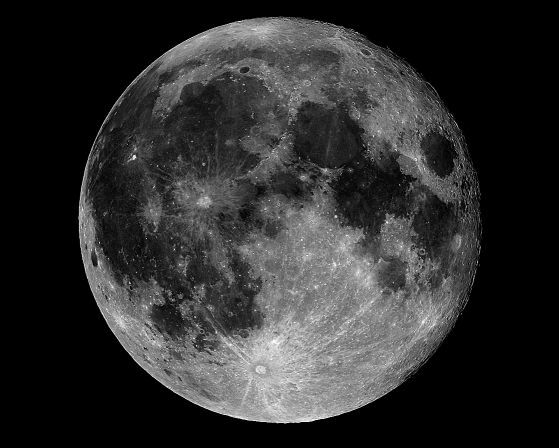 In 1982, a second full Moon of the month was visible. Known as a ‘‘Blue Moon,’’ the name does not refer to the Moon’s color but reflects the rarity of the event and gives rise to the expression, ‘‘once in a blue moon.’’ The Blue Moon of 1982 was even more special because a total lunar eclipse also occurred (for the United States) then. The image you see below has a strange significance as well. Not only is it the absolute finest photo of the full Moon I have ever seen, but it was recorded at a year’s end, too… on December 22, 1999 by incomparable astrophotographer Rob Gendler. That particular December’s Moon was special for another reason, as the full phase occurred on the day of the winter solstice, within hours of lunar perigee and just one month away from a lunar eclipse. For the eclipse, the duration of the partial phase will last within two seconds of a hour long, while the penumbral duration from beginning to end will run about four hours and eleven minutes. Penumbral contact will begin at 17:17:08 UT and umbral contact at 18:52:43 UT. The moment of greatest depth of shadow will occur at 19:22:39 UT, 31 December 2009. It will be visible from all of Africa, Europe, Asia, and Australia. What a wonderful way to end our year together. . . at light speed! With all the hype about blue moons, what would you call the opposite- two new moons in one month? Unfortunately, this article is factually mistaken. In 1937, Sky and Telescope Magazine made a mistake about the meaning of a blue moon, attributing it as the second full moon in a month. They corrected themselves later. The original definition involves lunar events within the solar year, not calendar months. In the three months from solstice to equinox or equinox to solstice, you typically have three full moons. If there are four, the third one is a blue moon. This yields just as many blue moons as the calendar method, although the moon that receives the designation is probably a different one. i appreciate your comment, gif… but if you read the article again, no where will you see that i refer to a “blue moon” as twice within a calendar month. i don’t mean to be touchy, but i am a very good observer who doesn’t grab onto “headlines” and am well versed in factual astronomy information. again, i appreciate the link to the sky & tel article because everyone should be aware of that long standing “mistake”.